What do you do on the days that you know you need to workout, or you really want to workout, but you can't? On days like this, when, for whatever reason (being busy, kids not cooperating, no babysitter, etc) I can't get a workout in, I usually try to do some really quick routine. Honestly, though, lately that has barely even been happening. But this last week, I've tried to work harder at getting some kind of workout into my day, even if it's small. Lately, by the time I am able to get around to a workout, I don't feel like doing a workout anymore. The kids are finally in bed and happy, and I just want to veg out on the couch. This is an even bigger problem for me when it's cold outside. So I know I've got to get into a routine and keep it before the winter hits. And one thing I know that is hard for me, is getting changed to do a workout, especially if it's a quick - less than 20 minutes- workout. So this week I decided I was going to do this little routine before getting ready for bed. Jeans, sweats, whatever, it didn't matter what I was wearing, I'd do my best no matter what. Holding a plank, without dropping down to my knees, for an entire song (usually a four minute song) is my goal right now. Sometimes it's easier for me to do this if I'm combining my plank with something else, like plank jacks or mountain climbers for a few intervals. If you need to start out small, do a knee plank instead of a full one, or pick a smaller amount of time for your goal. Hover squats are one of my favorite workouts. Mixing it up with full squats or pulsing a squat and holding a squat is what I usually do. The best thing about this workout, is that it's your workout. There's not a rule that says you have to do the exact same workout as me (or anyone else). So hold squat, make it a wall sit, work do full squats, whatever as long as it's for 3-5 minutes. Push-ups are something I used to be really good at but I'm not anymore. This takes a lot of work for me now to do full body push ups. My goal is to improve and gradually make it to 100 push ups. Right now I'm doing 5 sets of full body push ups with a one minute rest in between. The best thing about these at home workouts is that it's 100% your workout. It doesn't need to be exactly like mine or your workout buddy's or anyone else's. As long as your improving, that's what matters. Set small, achievable goals so that you won't get discouraged and keep moving forward and challenging yourself in new ways. 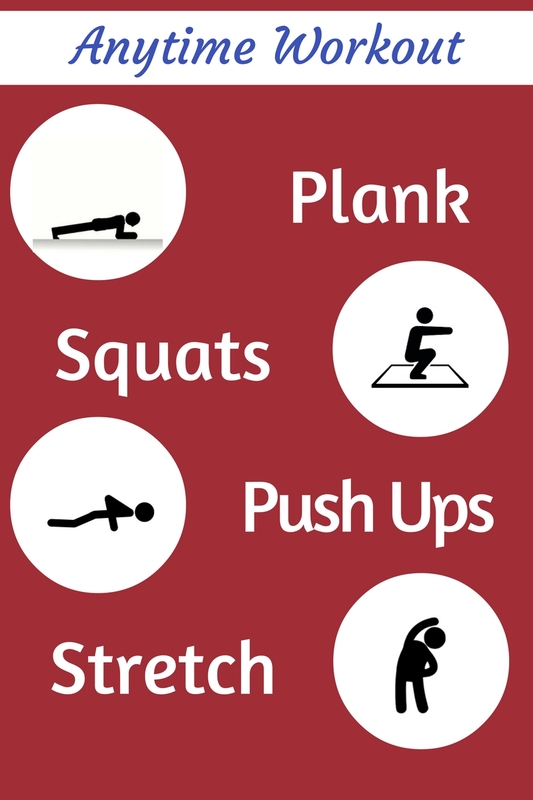 This might not be a really challenging workout, but it's still a workout. There might not be a lot of cardio or movement or anything like that, but even a little movement is better than no movement. What is your favorite kind of workout to do at home? When do you find a little time to squeeze your workout in?